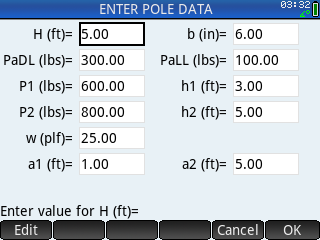 Description: Demo version of a program to perform calculations to determine the required embedment depth for free standing poles embedded in earth or concrete which are subjected to lateral and axial loading conditions. Both laterally constrained and unconstrained conditions can be analyzed, as well as isolated and non-isolated poles. The User inputs the physical characteristics of the pole, soil properties and lateral and axial loads and the program calculates required pole embedment depth. The program will analyze both round and rectangular shaped poles, multiple concentrated and full or partially distributed uniform lateral loads located at User specified points above the pole base. The User can also specify if the lateral loads are due to seismic or wind. Up to two additional axial loads can also be specified. In this demo version, only one lateral load can be specified, and allowable lateral soil bearing pressure is set to 100 psf/ft.